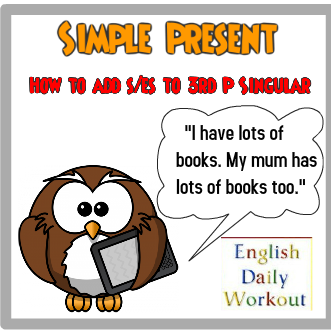 Some verbs change their spelling when s is added in the third person singular. The English letters a, e, i, o and u are generally referred to as vowels. The other English letters are generally referred to as consonants. When a verb ends in y immediately preceded by a consonant, the y is changed to ie before the ending s is added. In each of the following examples, the consonant immediately preceding the final y is underlined. However, when a verb ends in y immediately preceded by a vowel, the y is not changed before the ending s is added. In each of the following examples, the vowel immediately preceding the final y is underlined. Paying attention to which verbs change their spelling before adding s in the third person singular, fill in the blanks with the Simple Present of the verbs shown in brackets. He always _______ promptly. (to reply) He always replies promptly. She _____ little. (to say) She says little. They _____ bridge once a week. (to play) They play bridge once a week.